Thinking about all of the bells and whistles that go into building your dream kitchen can seem overwhelming. 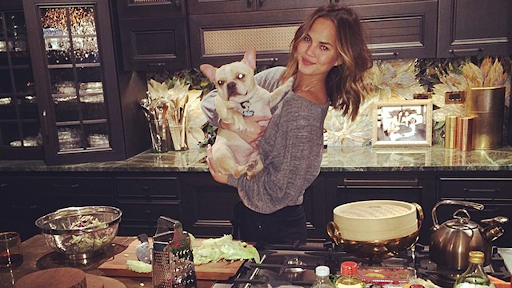 We are here to inspire you by taking a look at the famous celebrity kitchen of Chrissy Teigen! Chrissy Teigen has been known as a model, an influencer, an author, and a television host. She and her husband, musician John Legend, and two children reside in a beautiful and sleek five-bedroom, eight-bathroom modern home in Los Angeles. Considering Teigen has written her own cookbook and is a known foodie personality, the couple has quite a luxurious and efficient kitchen in their home. Let’s take a look at some of the features and fixtures of this modern celebrity kitchen. This kitchen has an open and airy design that allows natural LA sunlight to shine through during the day and efficient overhead lighting for night time. The dark gray walls give off the perfect contrast to the lightwood cabinets and hints of light-colored marble. Dark, wide-plank hardwood flooring brings warmth to the neutral room, making their kitchen the perfect family gathering spot. This kitchen is equipped with dual islands, including a beautiful marble-topped chef’s island and a kitchen dining table. This setup allows plenty of room for preparing meals and offers seating for the kids or guests. On Teigen’s Instagram page, you can see her and Legend not only prepping food, but enjoying an abundance of family time in their kitchen. Teigen’s kitchen has built-in luxury Thermador stainless steel appliances, including a gas stove, dual ovens, integrated refrigerator, and a wine fridge (where you can always see a few bottles stored). Teigen has also dished about some of her favorite kitchenware, including Le Cruset dutch ovens, Staub pans, and Lodge cast iron pans. Bow Echo Construction can help you create a modern dream home and kitchen just like Chrissy Teigen’s. Call us for a free consultation today!